When a game whose name means “exit” goes into something does it actually go out of it? 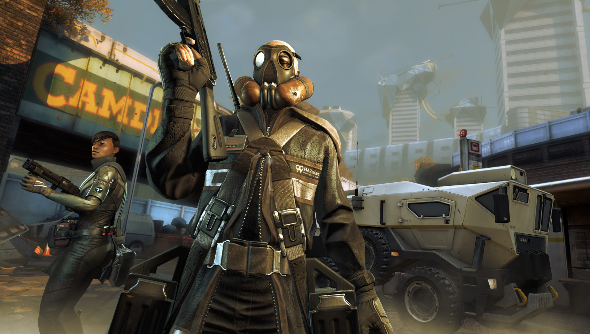 Whatever the case, Splash Damage’s free-to-play shooter, Extraction, has entered its closed beta. You can still sign up for the chance of being invited in. The beta includes Objective, Stopwatch, and Execution modes. It also features a number of maps based around London for you to try out. Also on trial in the beta is the game’s unlock system. So while playing you’ll be unlocking new mercs to do battle with. You could previously get into the game’s alpha for the princely sum of $120. So this free ticket is a real kick to the teeth that plumped up the cash for the alpha mode. Our man on the street, Steve, has already gone around and compared locations in the game to reality and found the results lacking in the bus schedule department but otherwise worryingly close. You can sign up over on the official website.